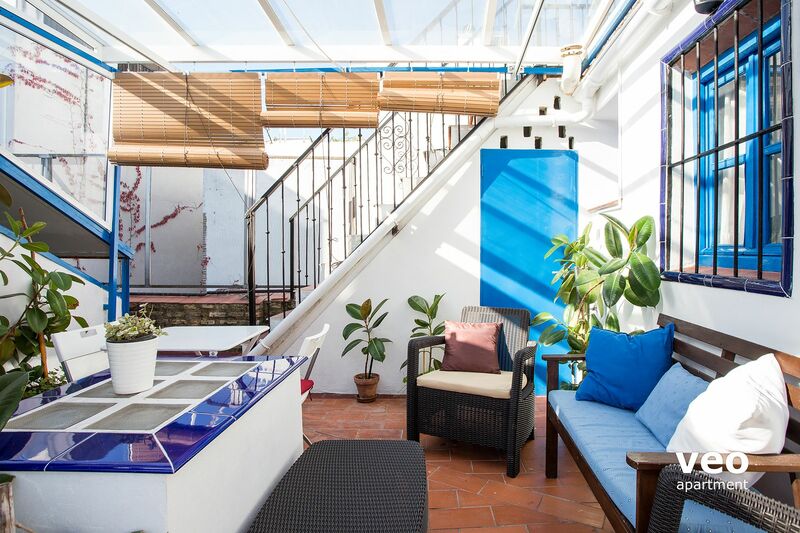 Charming top-floor studio with private terrace. 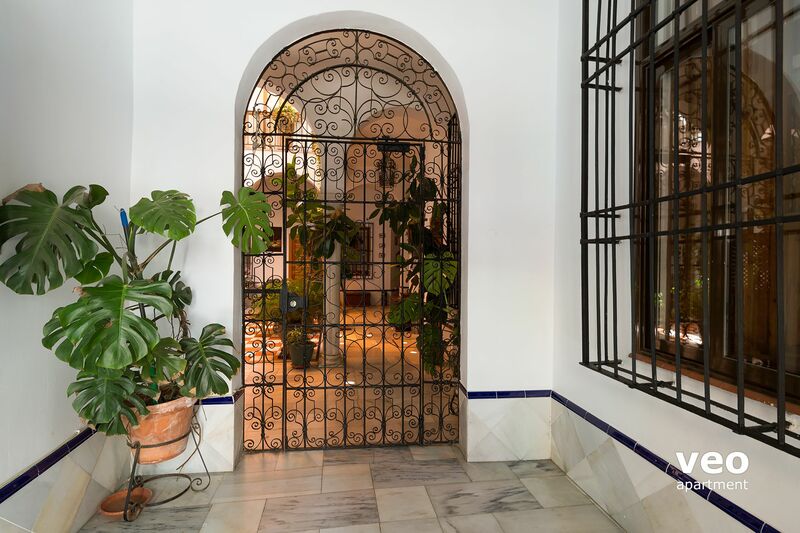 It is located in the historic centre, about a 30 minute walk from the Cathedral, in Macarena - one of the most traditional and liveliest neighbourhoods in Seville. 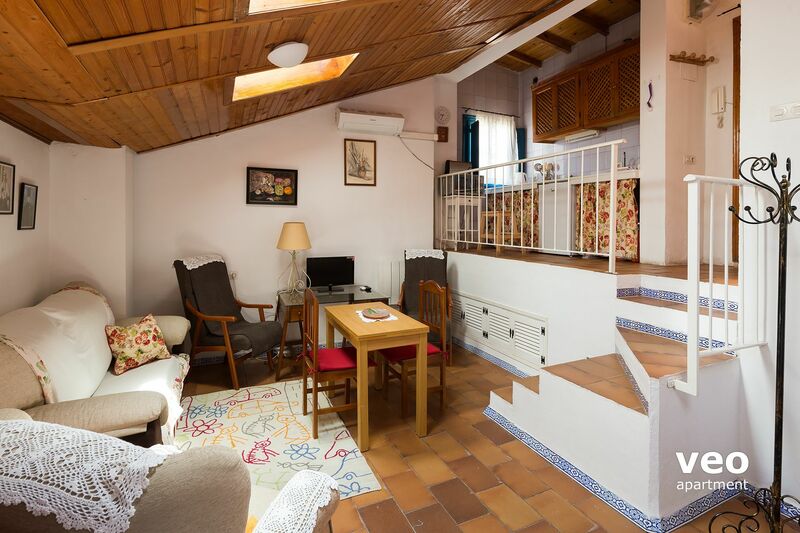 The apartment is welcoming, with terracotta flooring and wood ceilings. The living area has a sofa, a table and 2 armchairs. 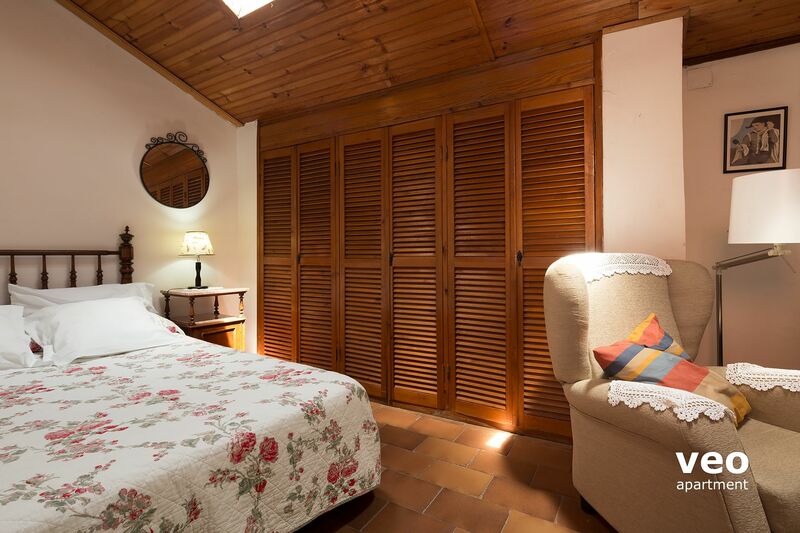 The sleeping area has a double bed and a large built-in wardrobe. 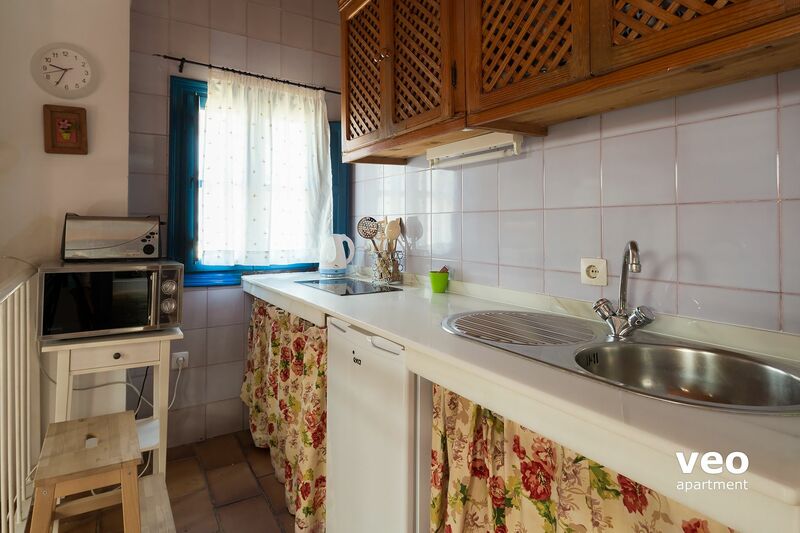 Six steps lead to a small kitchenette, equipped with a stove and basic utensils for cooking. There is a mini-fridge, a microwave, a hand mixer and a small electric oven (upon request). Opposite to the kitchen is the bathroom. 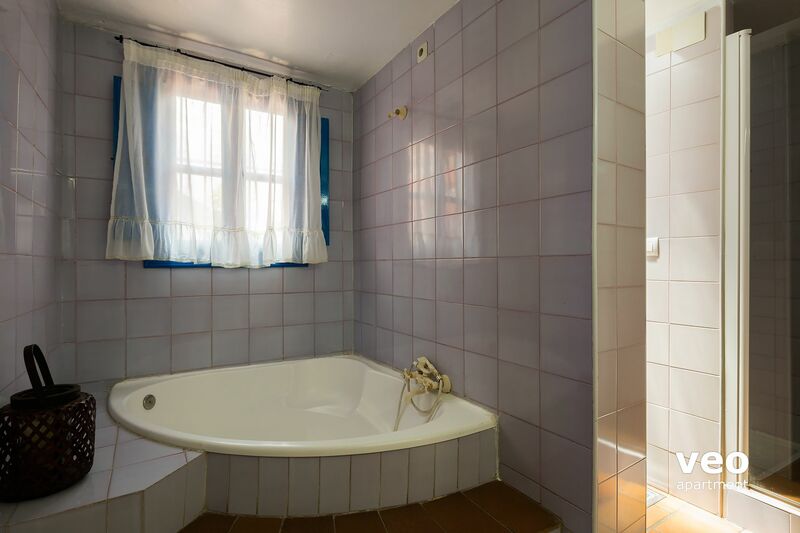 With a bathtub and a separated walk-in shower. 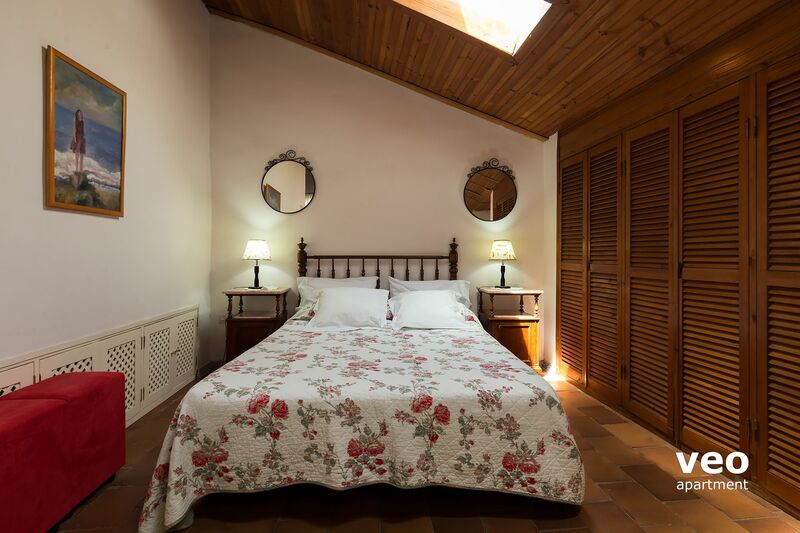 Other features: free WIFI internet access, TV and air-conditioning (cold/hot). 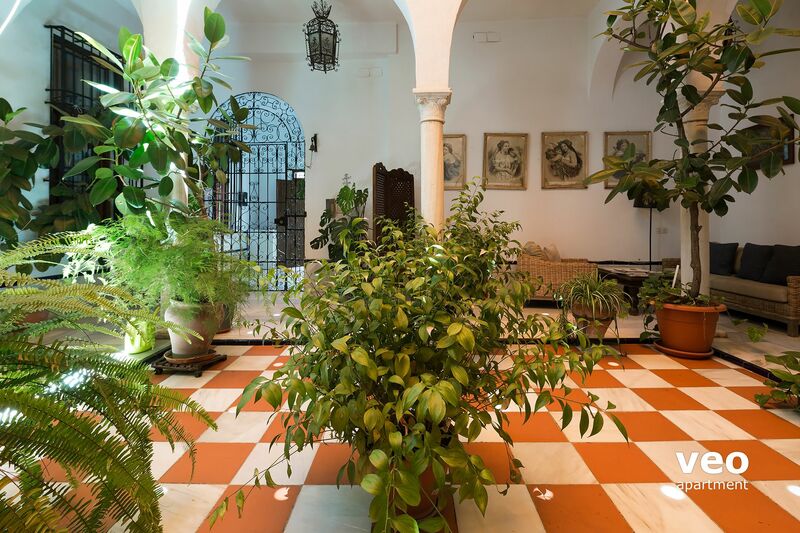 "Flores" features a lovely plant-filled terrace with outdoor furniture. 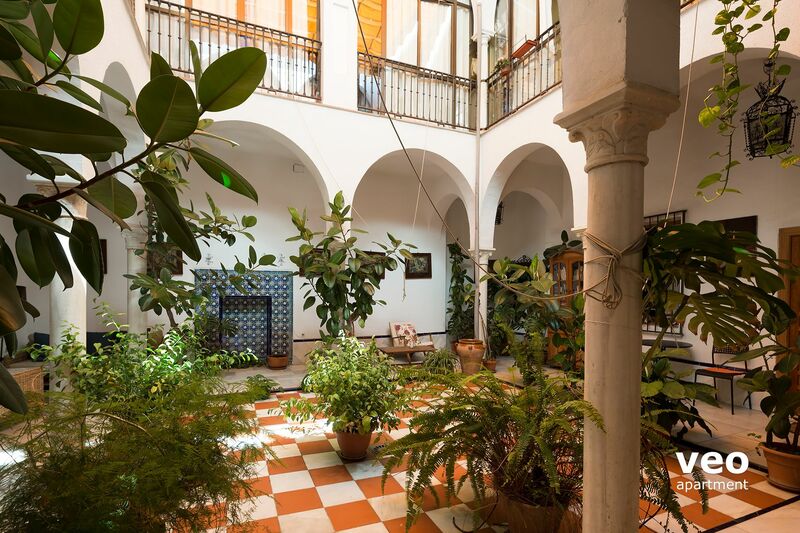 Set on the roof-top (second floor), this studio forms part of a "casa palacio" built in the Sevillian Regionalist style with a courtyard. We stayed in this apartment for 2 weeks in March. Delightful, very clean and with plenty spare cushions and blankets. Well situated with a good supermarket nearby. Sevilla centre and Almeda de Hercules were also within easy walking distance. 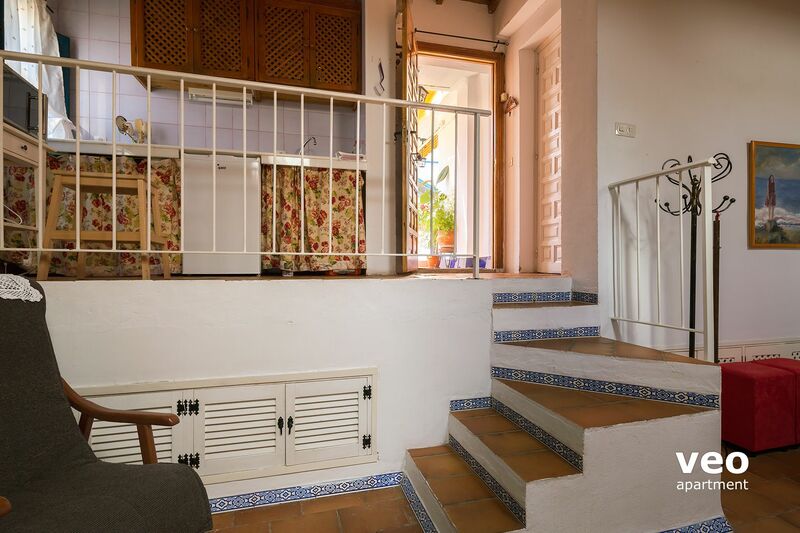 There are a lot of stairs as there is a roof top area which we loved, but if mobility is a problem then perhaps look for somewhere else. ll in all a very enjoyable stay. We enjoyed our stay at the apartment. The private terrace was simply wonderful. We spent most of our time there, as the weather was lovely. The bed was adequate and the house was clean. Great time! L'appartement est fort agréable et climatisé ce qui est parfait en période de forte chaleur. La terrasse est fantastique pour passer des moments fort agréable. 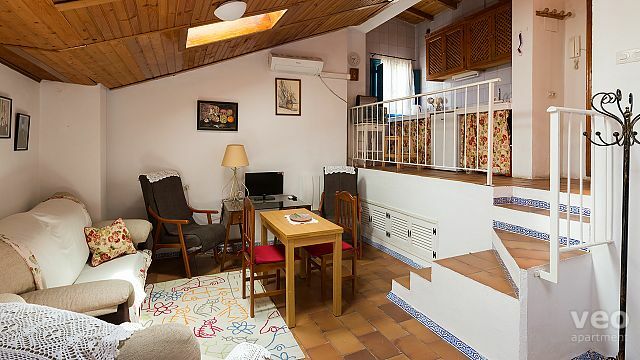 Je recommande fortement cet appartement, vous ne le regretterez point pour de superbes vacances. 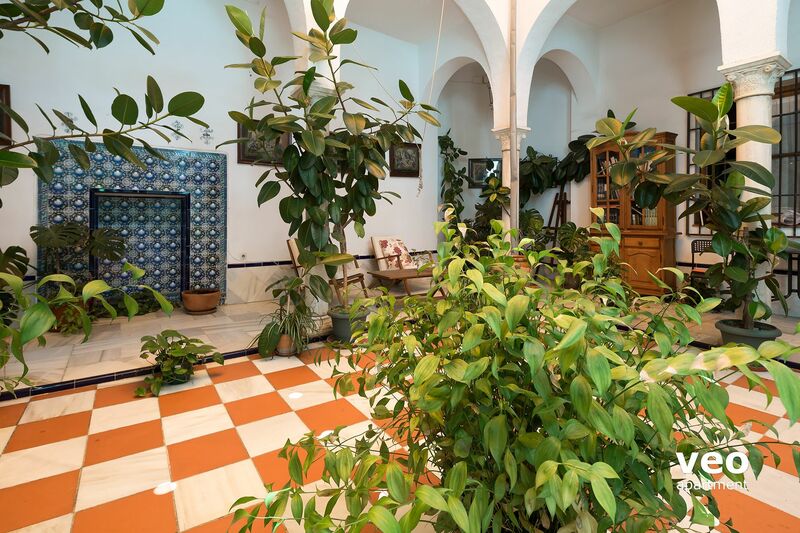 Herziges typisch spanisches Apartment über den Dächern mitten im Herzen von Sevilla. Alameda (Spielplatz), Giralda... zu Fuss erreichbar. Netter Vermieter. Très bon accueil, appartement sympathique et propreavec terrasses, tous commerces à quelques mètres, situé à 2 kms (30 minutes à pied) du centre dans le quartier Macarena avec bus devant la porte ! Gare à 25 minutes à pied. De l'aéroport au logement en 1 heure (aéroport gare en bus (4) puis à pied. Taxi possible.Excellent séjour. Merci. 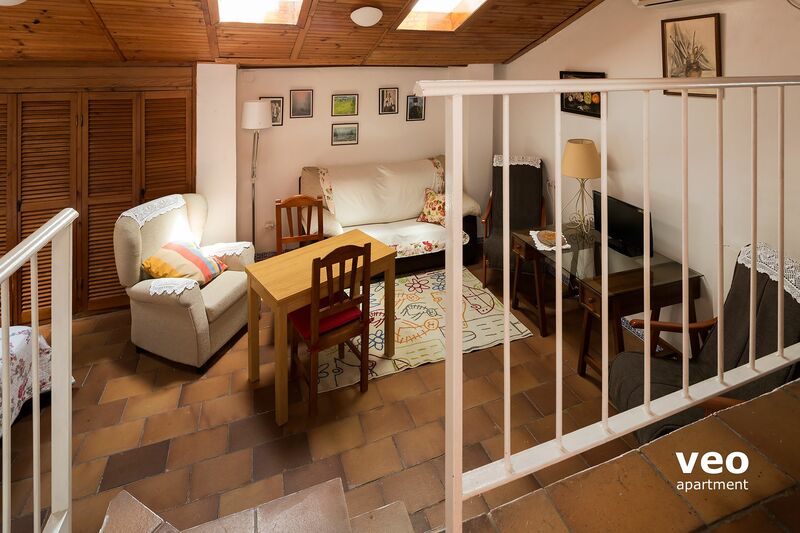 Great location in a good neighbourhood and not far from the centre. Park in SABA Macarena as the streets are narrow and every car in Sevilla is scratched. 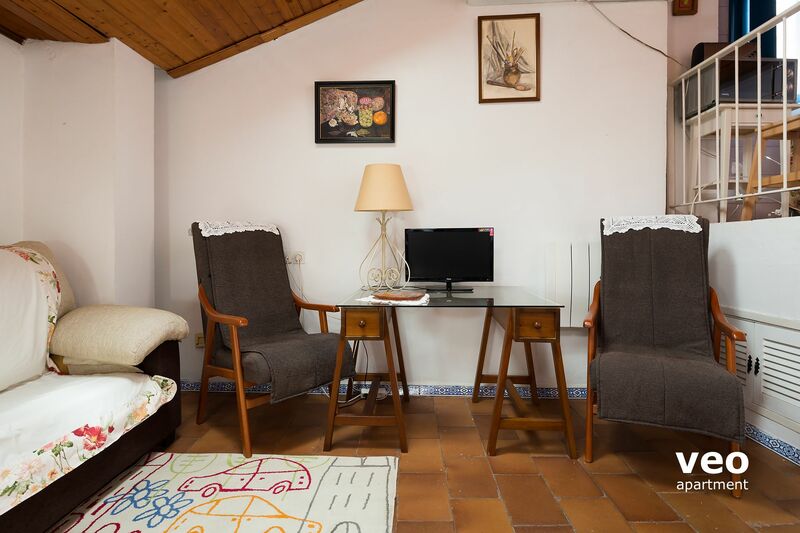 Apartment is clean and tidy with everything you may need and the hosts are very helpful with suggestions. Breakfast bar close by and another local bar had flamenca on the night of a Fiesta. Recommend Duo Tapas for xcellent food if a bit fast and Al Aljibe in the calle or on the roof. 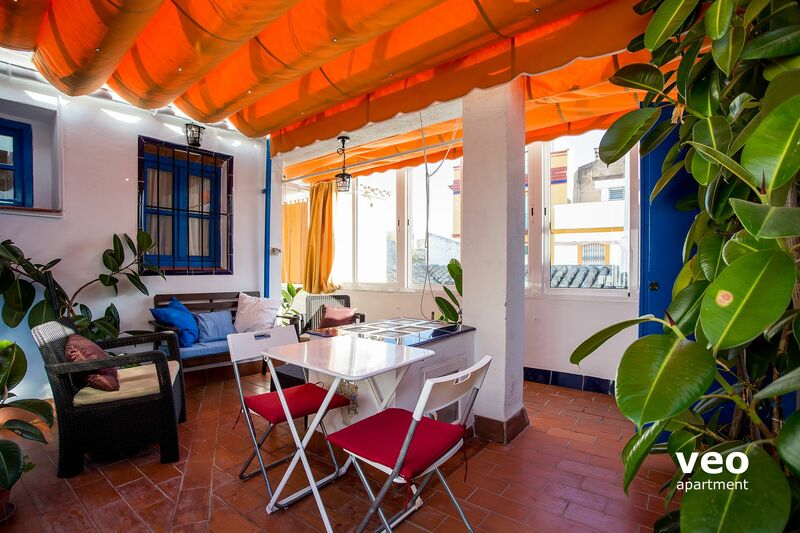 I`ve always dreamed to enter to the house with a patio and now I had been staying in one like these! Very nice, clean and quiet just from the entrance. 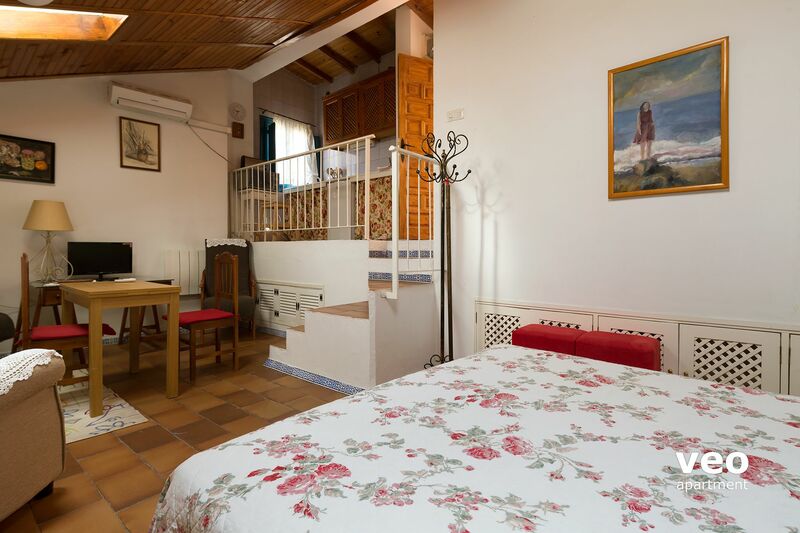 And the apartment itself: big bed, armchairs, some wardrobes, great bathroom, handy kitchenette and terrace - everything you can desire for vacations! And to feel really good there is la señora in the near to smile, to help or advise you. "Séjour très agréable dans cet appartement idéalement situé"
"Very nice place to stay in Sevile. Local atmosphere, close to everything. " This is a nice appartment. Terrace is relaxing, bed is comfy. But the best thing about is the area, Macarena. Beautiful old alleys, local atmosphere, close to sightseeings, restaurants etc. Would recommend it to friends. "Wonderful home from home "
Flores Terrace is a really lovely apartment - full of character and great use of space. 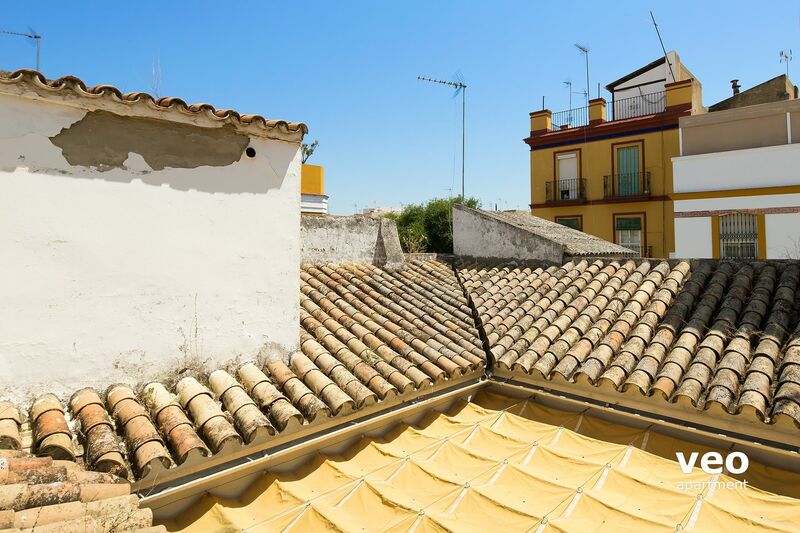 We felt at home straight away and it was great to come back to after a day of exploring Seville. The kitchen has everything you need (you can also ask if there's anything else you need). The bed was very compfy, the sitting area cosy and terrace was light and airy and great to sit out on as it's enclosed like another room - the top terrace was an added bonus and wonderful to sit up at night listening to the sounds of the city. I would highly recommend the apartment. The owner was a lovely host and made us feel very welcome, he was on hand to answer any questions we had. I would also highly recommend VEO Apartments - great service and organised taxis and shopping for us. Thank you. 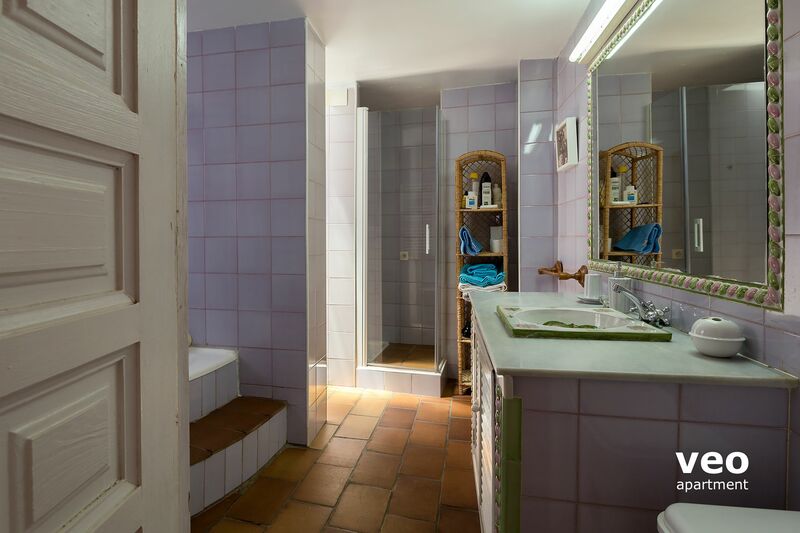 "The apartment was not modern but very appreciable due the placement in the city and the fontionnality (terraces, kitchen, bathroom)"
- the hot water was short on the shower so after few minutes we had cold water, but it was ok for us. - good placement in the city. "Excellent séjour à Séville et dans l'appart. Flores Terrasse"
Appartement propre, en bon état, fonctionnel avec une agréable terrasse dans un quartier sympa et animé, proche, à pieds, du centre ville touristique, des ruelles typiques et des commerces. La propriétaire discrète mais très gentille et serviable. "Appartement conforme à sa description"
Bon séjour dans un appartement idéalement situé et très agréable grâce à sa terrasse. 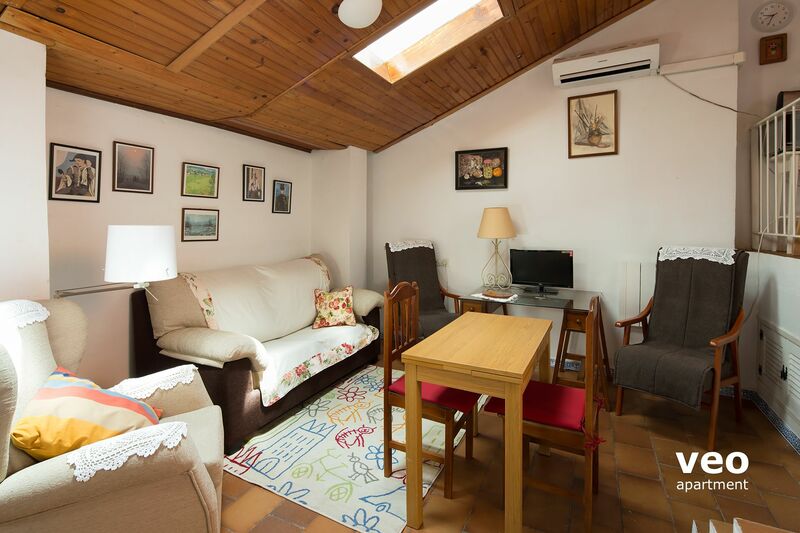 "Apartamento original y con encanto." 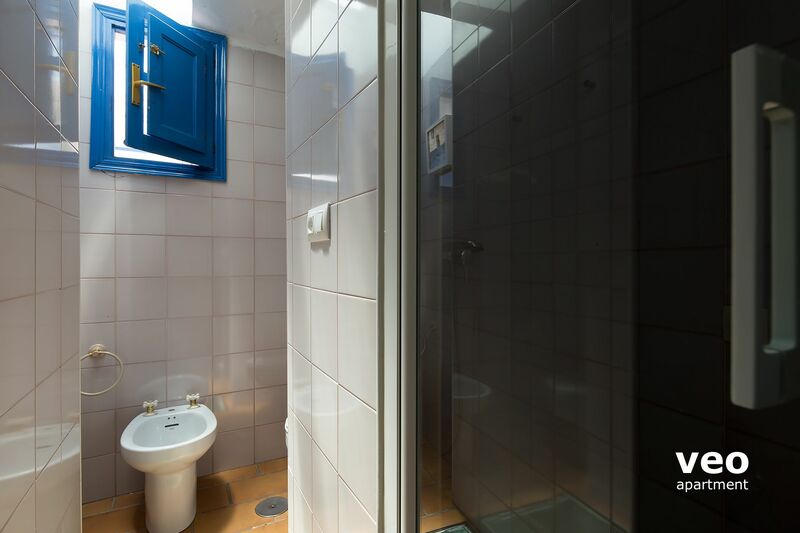 La valoración que damos a este apartamento viene condicionada sobre todo por su excelente ubicación para moverse por Sevilla, por estar en un barrio que aunque desconocido incluso por los propios sevillanos, y lo digo porque yo misma lo soy, no le falta de nada. Mención especial también para sus dueños que amablemente nos dieron permiso para hacer una comida en la preciosa terraza con nuestros amigos sevillanos. Recomendable!! Its a great apartment. 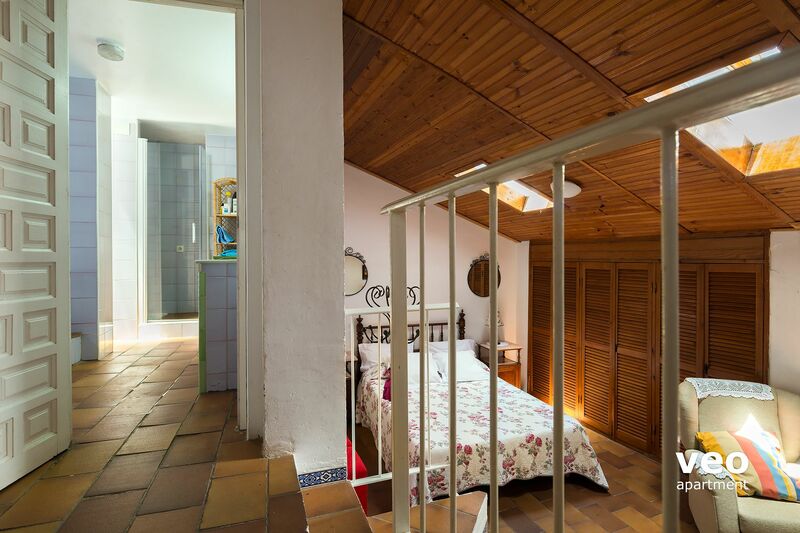 The living / bedroom is comfortable, the kitchen is very complete and it has a big bathroom with bath and separate shower. Sometimes we had some trouble with the warm water, but nothing serious. 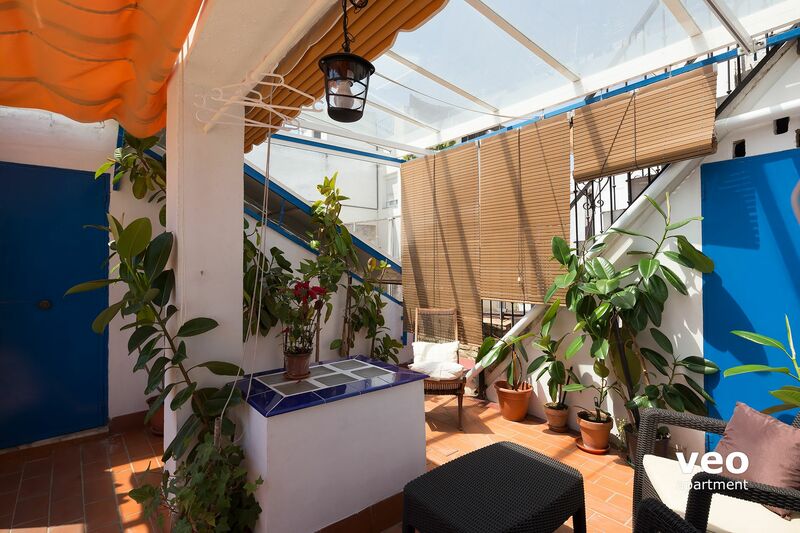 The big terrace has a glass roof (not yet present on the photos) which makes it very hot and muggy, not an asset to the apartment. 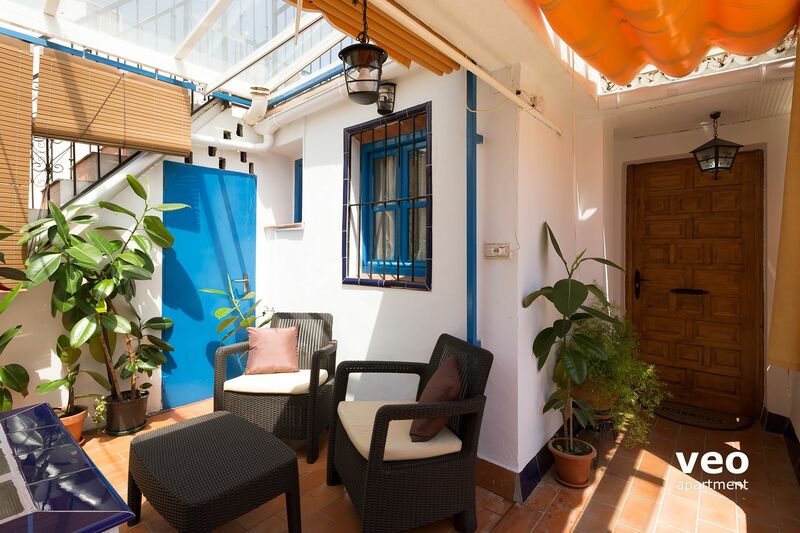 On the roof terrace there is sun all day long, great to stay if you love the sun! The location is not in the touristic part of the city, but nicely between the locals. 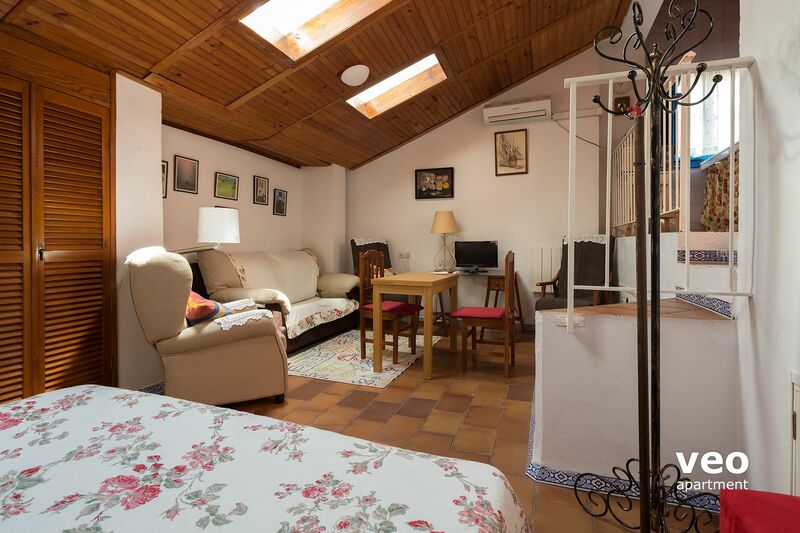 15 min walk from the center but a perfect stay.Everything was perfect, Manuel was a great host, being always available for any needs and the Macarena is good for being not in a touristic surraunding all the time. We'll be back! "Appartement agréable . La wifi est appréciable . Et le plus la terrasse"
Muy bonito, coqueto y práctico. Muy buena situación. The steps within the studio could be of concern! The apartment's location was quiet, handy for local shops and bars. Thoroughly enjoyable stay. Would book again. "Super (wie schon so oft)"
Das Appartment ist Urig aufgebaut, nicht mehr ganz neu und mit viel Charm eingerichted. ich fühlte mich von der ersten Secunde an, wie zu Hause! Die WiFi anbindung könnte stärker sein. "A very well appointed appartment & well situated for getting around." 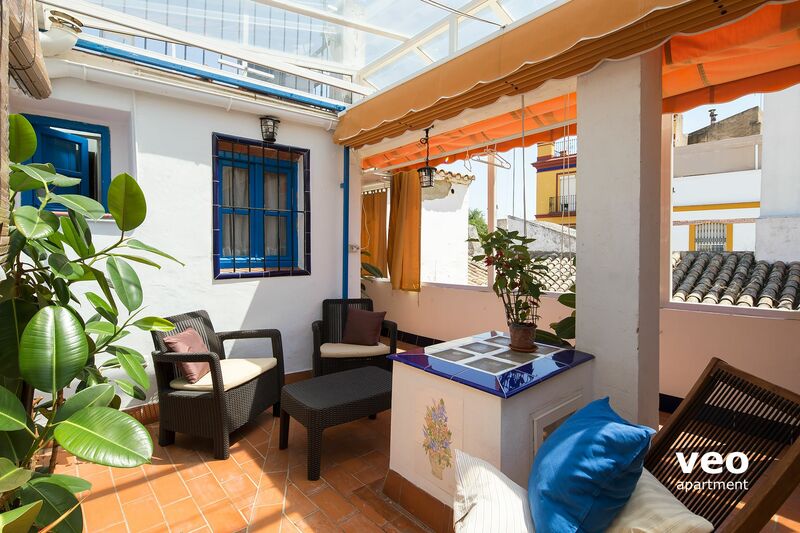 "Charmantes Apartment mit großartiger Dachterrasse"
Sehr charmantes einfaches und ruhiges Apartment in einem traditionell sevillanischen Wohnhaus. Vor allem die Dachterrasse ist ein Traum! Kleinere Geschäfte und Bars befinden sich in unmittelbarer Nähe. Die Flaniermeile Alameda de Hercules mit Bars und Restaurants ist nur 5 Minuten entfernt. L'appartement est très bien aménagé et décoré. 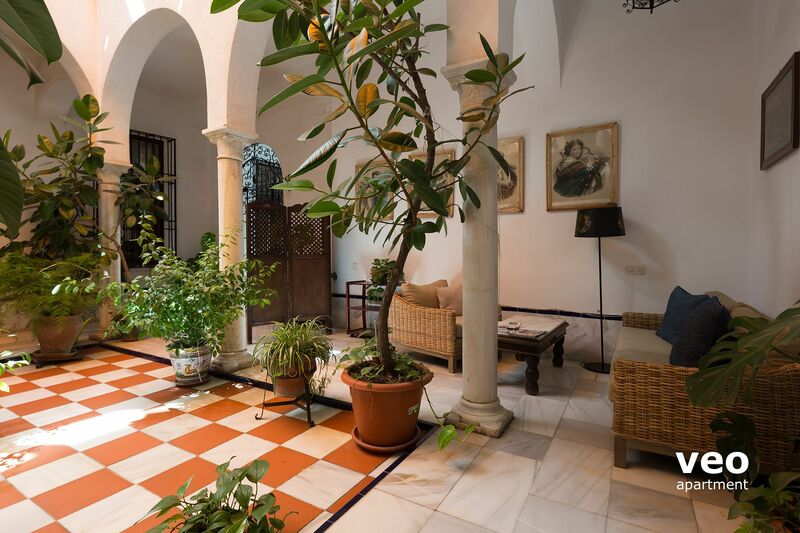 Le patio, la terrasse et les faïences donnent beaucoup de cachet au lieu, et la propriétaire est absolument charmante!! Agréable avec sa terrasse privée et bien situé proche du marché Feria avec ses produits frais et proche de la place Alameda d'Hercules avec ses restaurants et bars (5 minutes à pied). Pour aller au centre historique, comptez 25 minutes de marche. Le logement est relativement calme, très propre, bien décoré et le lit confortable. Le point négatif est le coin cuisine à améliorer (vaisselle sale à notre arrivée et manquante, matériel et équipements anciens). La propriétaire a changé le réfrigérateur la journée même après lui avoir indiqué son état vétuste. Elle est à l'écoute donc et a réalisé une jolie décoration du logement (vrai talent de couturière). Ainsi vu ces points à améliorer le prix est cher (70 par nuit). Pour les personnes à mobilité réduite, passez votre chemin car appartement au 2ème étage et marches dans l'appartement). Nous y reviendrons avec un tarif un peu plus intéressant. Réponse de la propriétaire : Merci beaucoup Céline pour vos commentaires. La cuisine est à présent équipée d'appareils électroménagers neufs : réfrigérateur, petit four, plaques vitrocéramiques, bouilloire et grille-pain. Nous avons également changé la vaisselle.